BLADE Network Technologies, Inc., the industry leader in network virtualization and high-performance solutions for servers and storage, today announced its new BLADEHarmony™ Manager 3.0 management software. Using BLADEHarmony Manager 3.0, data center administrators can easily and efficiently manage and monitor thousands of BLADE Network Technologies’ 1Gb and 10Gb blade switches within HP BladeSystems, IBM BladeCenters, and NEC SIGMABLADEs, as well as BLADE’s own top-of-rack RackSwitch family. Managing thousands of BLADE Network Technologies embedded and top-of-rack switches is now as easy as a click of a mouse. BLADEHarmony™ Manager 3.0's unified management provides a comprehensive replicable data center view of I/O, with single-click updates to thousands of BLADE's embedded and top-of-rack switches. It also extends the capabilities of traditional Element Management Schema by complementing and integrating easily with existing management systems, such as HP Systems Insight Manager and IBM Director. BLADE will demonstrate the capabilities of BLADEHarmony Manager 3.0 in booth 726 at the 2008 Next Generation Data Center (NGDC/LinuxWorld Conference and Expo), August 4-7, at the Moscone Center in San Francisco, Calif. In addition, a free trial version of BLADEHarmony Manager 3.0 is available for download for a limited time at: http://www.bladenetwork.net/bhm. BLADEHarmony Manager 3.0 provides an easy-to-use, Web-based management interface designed for the data center administrator. From any browser, administrators can connect to BLADEHarmony Manager 3.0's centralized server to easily provision the I/O for an entire rack, independently managing I/O capacity on behalf of servers and storage. They also can detect switch-based failures instantly and take corrective action. Client-server architecture. 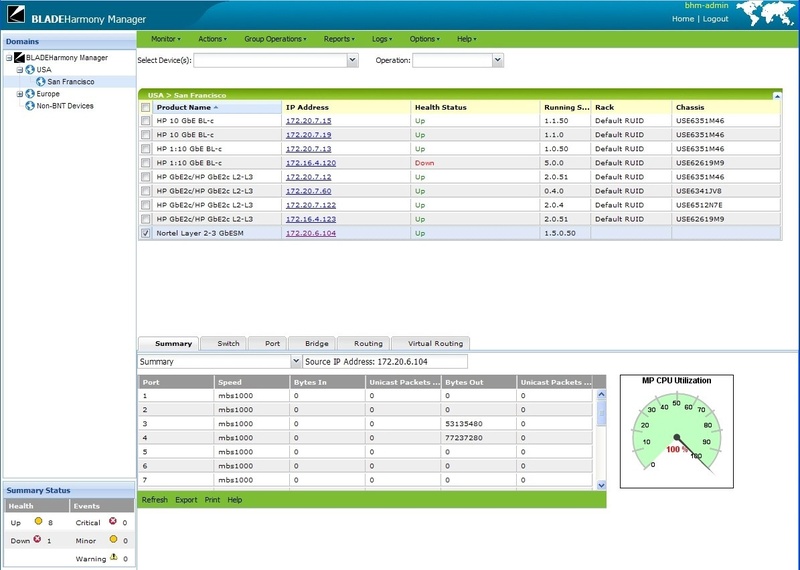 Web-based GUI for simplified device configuration, monitoring, and fault management. Integration with industry-leading Enterprise Management Systems (such as HP Systems Insight Manager and IBM Director). Customizable reporting of detailed asset, operational, and performance information. Automated and scheduled software downloads, configuration updates/backups, switch reboots, and so on. "BLADEHarmony Manager 3.0 provides new capabilities in our innovative Rackonomics approach for reducing total cost of ownership and simplifying management of scaled-out data centers," said Dan Tuchler, Vice President of Product Management and Strategy, BLADE Network Technologies. "Managing thousands of BLADE Network Technologies embedded and top-of-rack switches is now as easy as a click of a mouse." BLADEHarmony Manager 3.0 is available with BLADE's BLADEHarmony Premium Support Services from BLADE Network Technologies. BLADEHarmony Premium Support Services offer tight integration of systems, software, services, and support for BLADE Network Technologies' switches embedded in HP BladeSystem, IBM BladeCenter, and NEC SIGMABLADE blade servers, as well as for BLADE's top-of-rack RackSwitch family. For more information, contact services@bladenetwork.net. Download a free trial of BLADEHarmony 3.0 for a limited time at: http://www.bladenetwork.net/bhm. BLADE Network Technologies is the leading supplier of Gigabit and 10G Ethernet network infrastructure solutions that reside in blade servers and "scale-out" server and storage racks. BLADE's new "virtual, cooler and easier" top-of-rack switches demonstrate the promise of "Rackonomics"—a revolutionary approach for scaling out data center networks to drive down total cost of ownership. The company's customers include half of the Fortune 500 across 26 industry segments, and an installed base of over 170,000 network switches representing more than 4 million switch ports. BLADE Network Technologies: Building next-generation data centers one rack at a time with Rackonomics. Visit: http://www.bladenetwork.net. 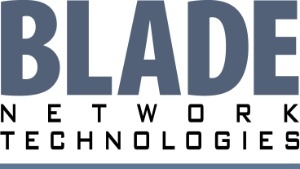 BLADE Network Technologies, BLADEHarmony, and BLADEHarmony Manager are trademarks of BLADE Network Technologies. Other products and companies are trademarked by their respective owners.